This statistic displays the penetration of e-commerce, t-commerce and m-commerce in the United Kingdom (UK) in 2013. Of respondents, 87 percent reported having completed an online purchase via computer in the six months previous to survey. 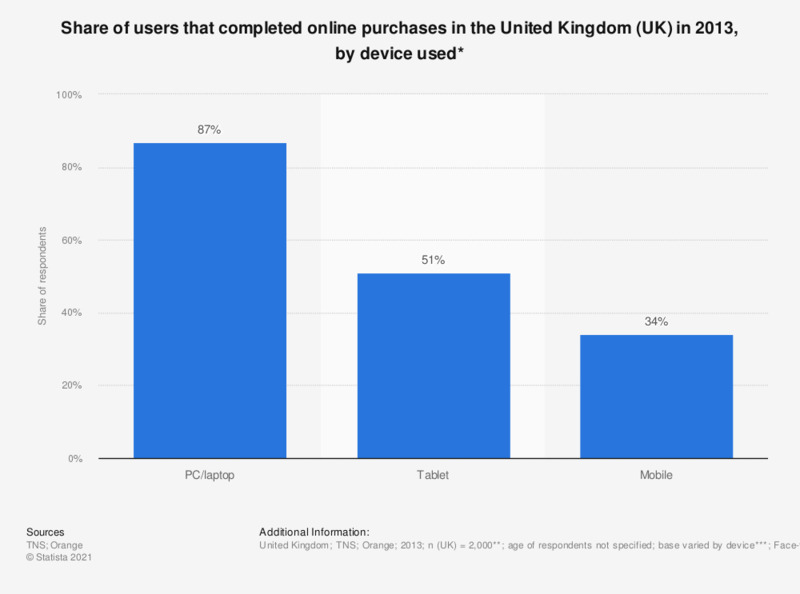 * The source specified: "Online purchases completed on devices in the last six months." ** The source indicated: "Calibration phase consisted of 2,000 face-to-face interviews in each country (UK, Spain and France). Main research conducted online with 1,000 mobile media users." *** Base for PC/laptop: connected mobile and computer users. Base for tablet: connected mobile and tablet users. Base for mobile: connected mobile users.